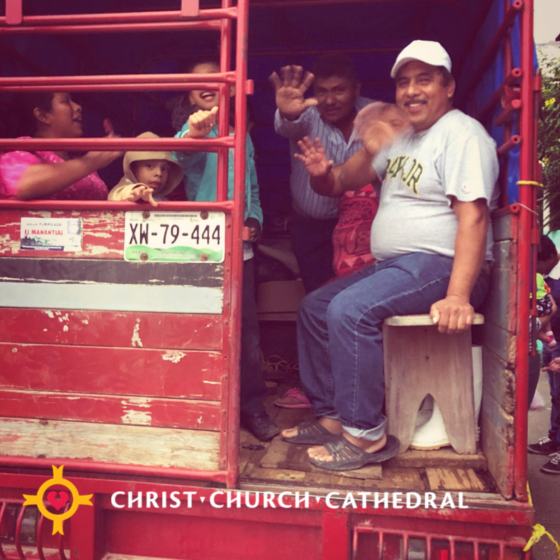 A recap of some of my daily experiences from our recent mission trip to the Diocese of Southeast Mexico: Early Saturday morning, December 2, we gathered at the Indianapolis Airport to leave for our trip to Nuevo Progreso, Oaxaca, Mexico. It was a long day of sitting and waiting on planes with time spent getting to know each other better. The day was pretty uneventful. Thank God!!! After our long day of travel, we were met at the airport by Bishop Benito Juárez Martinez and his son Eigner. They took us to the hotel and then we met for a late, but very enjoyable, supper. On Sunday morning, we were up early for breakfast and ready for the long journey to the church of La Tranfiguración. The people of the church greeted us with much love, fireworks, and showered us with flower petals. There was also a confirmation during the service that day. After the service, the people prepared us a great meal. We ended our visit that day sitting in a circle, each one of us telling a little something about ourselves. That was especially interesting. Then we headed back to Acayucan, to San Juan Evangelista Church, to meet with the congregation there. Once there, we greeted each other with a song known in Spanish as “Canto Para Pedir Posada.” The title means “song to ask for shelter.” It recreates an imagined conversation between Joseph and an innkeeper, in which Joseph explains that he and his wife need a place to stay for the night and the innkeeper initially refuses. We stood outside the door singing to the people on the other side of the door until they let us in. We shared another meal, building community through our interaction. There was a heart-felt connection by all. 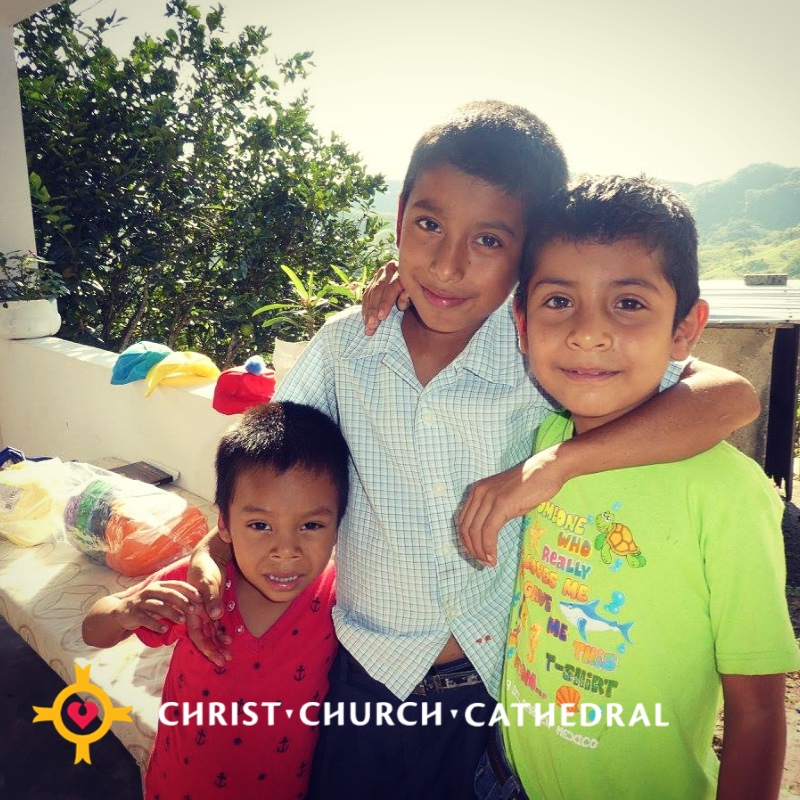 On Monday, we gathered for breakfast and then headed back out to La Transfiguración, Nuevo Progreso. The people were eagerly waiting on us. We gathered for worship and then played some games together. Afterward we split up and some of us started painting the outside of the Water Treatment Plant. The others helped the local people with crafts and games. We said our goodbyes for the day and headed back to the hotel. We met for supper and then gathered by the pool for some time of reflecting how God had stirred our hearts and souls so far. Tuesday turned out to be a very interesting day. After breakfast, we loaded up the van for our 2+ hour drive back to La Transfiguración. After traveling about three quarters of the way there, we passed through the small village of Maravilla. We drove through a line of local village protestors. Some were armed with rifles and others with big machetes. Some even wore masks. Not knowing what was going on we turned around and headed back to the main road. We stopped at a local roadside restaurant to discuss what we saw and felt. We later discovered that they were the people from the village of Maravilla. They were waiting on the local government officials to talk about unkept promises made to the villagers. It was quite obvious they were not happy. Because we were outsiders and because one has no way of knowing the level of danger that could come from this type of situation, it was decided that for the safety of us all we would not return to La Transfiguración, Neuvo Progreso on this trip. Being too late to start anything else that day, our host wanted to take us to eat in the village of Catemaco. We went to Restaurante Bar La Ola. After dinner, we walked around the town and headed back to the hotel. There were lots of feeling of sadness and disappointment over the fact that we didn’t get to finish up the projects we had started on Monday at La Transfiguración. Wednesday, we gathered for breakfast and shifted our focus to a new challenge from Padre Jose Luis to make some improvements at San Juan Evangelista, one of his other three parishes. We were going to paint the entrance doors and build five new bench pews. Also, the play of El Pastor Turulato (The Shepherd Turulato) and fiesta planned for La Transfiguración was now being planned instead for the people of San Juan Evangelista. We scurried around town shopping for the materials needed to complete our new tasks, enjoying the local culture and people we met along the way. The day turned out to be very successful and fulfilling. Back at the hotel we again gathered poolside to reflect on the day. Thursday gathering for breakfast would be our last time with Bishop Benito. He had been with us every day. He presented each of us with a bag of local coffee and gave us his heart-filled thanks for our work and bid us goodbye. After breakfast, we decided to walk to the church. Today’s goal was to get the projects finished from yesterday and set up for the play El Pastor Turulato and a fiesta that night. Work was going well, and most things were finished by 1:00 pm. We were thinking about what to do for lunch when, low and behold, a small truck with cattle racks and a station wagon pulled up to the front doors of the church. Out comes almost the entire congregation from La Transfiguración, complete with all the trimmings for lunch, including the grill and the coals for cooking. They brought everything. They wanted us to know they loved and supported us. After a wonderful meal and fellowship, the kids presented the play El Pastor Turulato for us and we had a piñata for the kids, sang songs, laughing and sharing in the love of God. Words cannot convey the emotions and feelings of the love for one another in these moments. After our long goodbyes, we took a deep breath and started getting ready for our second fiesta of the day. We were tired but emotionally charged. At about 7:00 pm the people of San Juan Evangelista started showing up, and we did another version of the play El Pastor Turulato for them, had another fiesta including another piñata for the kids, sang more songs together, bonding yet again with another group of people. One by one, they left. We said our goodbyes, now exhausted. We helped Padre Jose Luis clean up and headed back to the hotel. Friday, we were up early to pack, meet for breakfast, say more goodbyes, load up the van and start our journey homeward through Veracruz. After the long drive, we arrived at the Centro Comunitario Amiguitos, a center where they have a school, sponsored by the Diocese of Southeast Mexico, in conjunction with the local public education system. This is a one room school housing grades preschool through online college courses. The building consists of one room of about 300 square feet serving around 120 students, 6 days a week, and as the local community church on Sundays. The students were so well behaved, and you could tell they are eager to learn. We sang some songs together in both Spanish and English, then shared questions with each other. This was a very humbling experience. After this we went to eat our last big meal together, then to the hotel for a rest before our flight home on Saturday. I learned this week, more important than the tasks to be accomplished, are the relationships that were built between the new people we met and the people that went together. Our focus should be on bridging the gaps between cultural differences at home and abroad. That is, to come as you are, meet one another as the child of God that we each are, be open to His Holy Spirit, cross unknown boundaries, and be able to receive the Love of His humanity, especially in sharing our differences which makes each one of us so unique. And at least for me, I think it was a very successful mission.